The Sewell native broke current NHL All-Star Johnny Gaudreau’s single-season goals record at Gloucester Catholic in 2019, is eyeing a chance at being selected in the USHL draft, and has a Division-I scholarship lined up, too. A little more than two years ago, shortly after his 16th birthday, Domenic Garozzo had a unique opportunity to get a feel for what his post-high school ice hockey career might look like. He went to a camp in Sioux Falls, South Dakota. Garozzo was there to check out the Sioux Falls Stampede, one of the most popular teams in the USHL (United States Hockey League). The Stampede regularly fill the Denny Sanford Premier Center, the largest arena in the league, to capacity (an estimated 12,000 seats). NHL stars Thomas Vanek and T.J. Oshie are among among those who played in Sioux Falls as Junior hockey league players. Garozzo, a Sewell resident and just a couple of months away from graduating from Gloucester Catholic High School, is moving closer to making that dream a reality. He is fresh off one of the most prolific scoring seasons in South Jersey hockey history, breaking a school record held by an NHL All-Star. And he has a Division-I scholarship lined up, too. 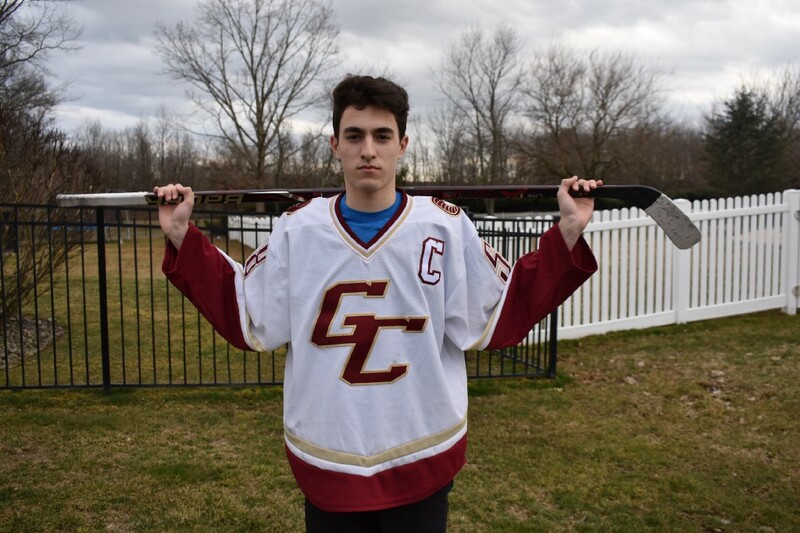 For all of his efforts, Garozzo is the 2019 Sun Newspapers Ice Hockey Player of the Year. Garozzo scored an astounding 31 goals in 17 games this season. He had seven multi-goal games as a senior and also collected nine assists. When Garozzo scored his 31st goal of the season — 12 minutes into the Non-Public state semifinal against Don Bosco — it set a new Gloucester County program record for goals in a single season. Making the accomplishment more remarkable is this: the previous record holder is current Calgary Flames superstar Johnny Gaudreau, who scored 30 goals for Gloucester Catholic in 2009. So how do you improve your game enough to break an NHL All-Star’s high school record? Ice time helped, surely. Garozzo played under Gaudreau’s father as a tyke and plays hockey nearly 12 months a year between his club team and high school. As with any trade, the more you play, the better you get. But there is another, more tangible difference between Garozzo now and when he was a 16-year-old at the long weekend camp in Sioux Falls. He’s grown nearly half a foot, from 5–6 to his current 5–11. And when you’re a skill player, size matters. Garozzo was able to do that in his senior year of high school and the results were dramatic, becoming one of the state’s most lethal goal scorers. He’s hoping it puts him on the radar of the Junior teams like the Stampede, who hold their draft in May. 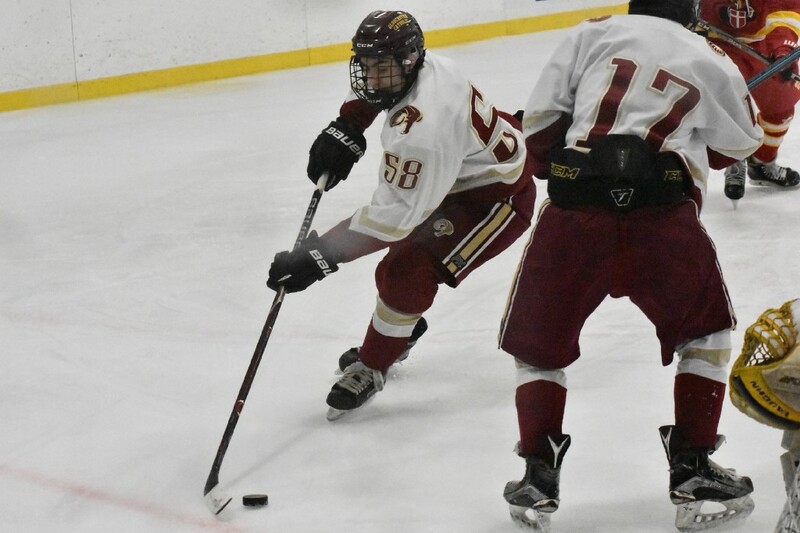 A year or two of playing at Juniors could see even more growth from Garozzo, both physically and as a developing prep player, before he enrolls at St. Lawrence University for his collegiate career. After a record-setting senior year, it’d be unwise to bet against Garozzo when it comes to realizing his goals.